The Maine Surf White collection offers a New England style of contemporary living. 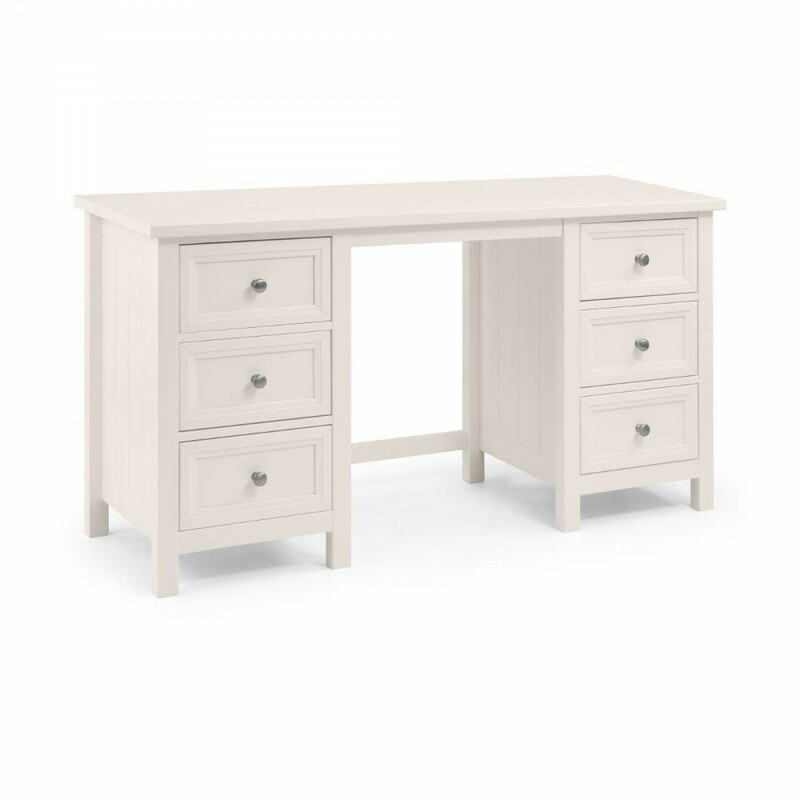 Combining storage solutions with timelessly classic style, we bring to you the Maine Surf White Dressing Table. A must-have for every stylish bedroom, complete with an amazing 6 storage drawers, chamfered cabinetry and delicate finishing touches for a classy bedroom. Built from strong solid pine wood, this piece is the perfect bedroom addition for a convenient and cosy atmosphere. Combining fashionable style with discrete storage enables you to make the most out of your bedroom space and keep that clutter to a minimum. Coated with a white lacquer to withstand wear and tear and provide a neutral finish to be welcomed into a wide range of bedroom styles. The enduring style of the Maine Surf White Dressing Table stems from the pretty finishing touches such as pewter handles and a lined detailing in the side panels of the pine wood construction. We have ensured that while we prioritise quality of product, we are also presenting a beautifully finished piece of furniture to our customers. The contemporary classic edge of this range ensures an everlasting fashionable piece. Coordinating Maine Surf White Dressing Stool is also available in this range, perfect for completing the look. The Maine Surf White Dressing Table features six spacious storage drawers ensuring not only stylish appearance but also practicality. Our high quality construction consists of three draws on either side, for ease of access and convenience. The parallel drawers are of equal sizing and are suitable for all of your needs. Fill the Maine Surf White Dressing Table with endless beauty products, accessories and electricals to ensure your bedroom always looks like a show home! We pride ourselves on our high quality construction of the furniture we send to you, that's why this piece is crafted from a high quality pine wood. A sturdy foundation doesn't have to appear practical and unattractive - we have ensured all of our pieces are delicately finished to give each furniture item a characterful and elegant exterior. Our furniture arrives at your door flat-packed for easy self-assemble with full instruction manual provided with every purchase.